Science in Montessori is known for introducing children to advanced topics in the early years, preparing them for a lifetime of discovery. Topics range from how the world began to the basic principles of astronomy, botany, chemistry, physics, and zoology. At the same time, the Montessori materials and lessons are meant to encourage a sense of wonder at the grandeur of the universe, the simple beauty of the physical laws, and the miracle of life. 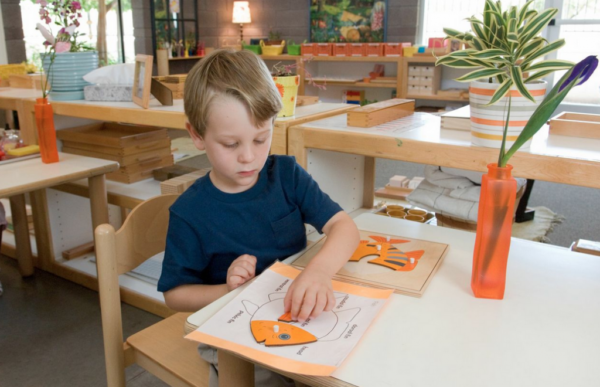 Beginning with lessons in sorting objects intended for the youngest child, and extending all the way to engaging in debates about climate change, the Science Scope and Sequence was designed to be a comprehensive resource that provides essential information to Montessori guides for classrooms ranging in age from Toddler through Upper Elementary. The Science Scope and Sequence provides students with many opportunities to focus on the process and issues of science: the study of life, the laws and structure of the universe, and the work of scientists. Students learn to ask questions, follow a systematic process of observation, collect and analyze data, and conduct controlled experiments. With these goals in mind, the sequence of the use of lessons and materials is important. All of the content for Science is divided into sub-categories and these sub-categories and the lessons within them are listed in the order in which they would be introduced for most children in many Montessori classrooms. The Science Scope and Sequence is displayed in the following “online magazine” format. Lessons/Materials are listed on the spreadsheet, sequenced the same as they are in the Montessori Compass online record keeping software. Each lesson/material may contain multiple elements, which are tagged to the appropriate cycle year(s). In some cases, parent-friendly descriptions will be listed, designed to help parents gain greater insight into the Montessori classroom.